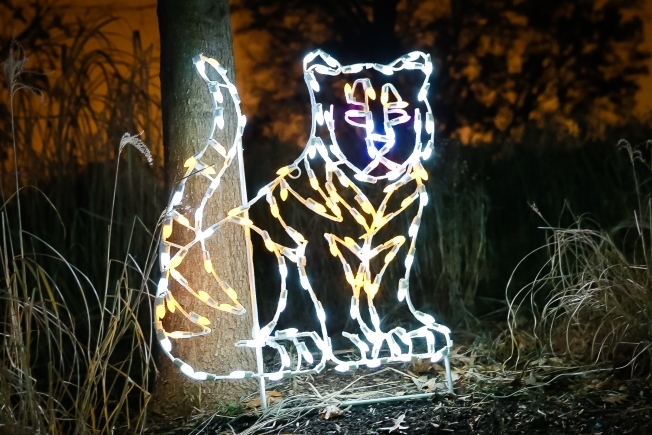 A new animal each day in our 12 Days of ZooLights series. Are you as excited as we are? Welcome to 12 Days of ZooLights, where we celebrate the festive lights decorating the Smithsonian's National Zoo at the holidays! Why we love the display: Great cats are a lot less scary when they're made out of lights. Habitat: Tigers roam from Asia to India all the way to the far east of Russia. At the Zoo: The Smithsonian's National Zoo's Sumatran tiger Damai just gave birth to two tiger cubs in August, doing her part to counteract the dwindling Sumatran tiger population. Bet you didn’t know... Tigers are critically endangered and estimations suggest that there are less than 50 of some subspecies left in the wild. About ZooLights: In this yearly display, more than 500,000 environmentally-friendly LED lights transform the Zoo into a winter wonderland. Check out the new garden scene light sculpture. Thanks to our partners in the 12 Days of ZooLights.